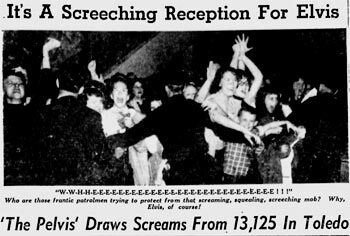 Squarely in the middle of the rapid rise (and accompanying cultural tumult) of Elvis Presley, the 21-year-old singer stopped in Toledo on Thanksgiving day 1956, played two shows at the Sports Arena, and beat up a guy later at the Commodore Perry Hotel. The timing of Presley’s visit to Toledo was remarkable. By this point, Presley was a national sensation: young folks mostly loved him and adults mostly reviled him. He’d already had five singles at No. 1, had already appeared on The Ed Sullivan Show twice, his first movie, Love Me Tender, opened at the Paramount two days earlier (“His ability as an actor is debatable,” The Blade wrote in a Thanksgiving Day review), the song Love Me Tender was No. 1 on the Billboard charts, and within two weeks, he would be present at the legendary Million Dollar Quartet session in Memphis with Johnny Cash, Jerry Lee Lewis and Carl Perkins. The whole story, written by The Blade’s Charles W. Gilmore, has an adult spin and an adult viewpoint. A couple of days later, however, The Blade caught up with Balint, who claimed Presley owed him $200 for the fight. He claimed the whole thing was arranged in a bar between shows. He spent a couple of days in the Workhouse until his father bailed him out, and had been fined $10 (with $9.60 in costs). Presley returned only one other time to Toledo, an April 23, 1977 concert at the University of Toledo’s Centennial Hall. Alas, the paper with the review is missing, but the tease on the following Monday’s front page makes you wonder.